Oaksterdam Marijuana and Hemp Museum Is Forced to Find a New Home; Seeking Exhibit Sponsorships. The Federal raid on Oaksterdam properties in April has forced the not-for-profit downtown attraction to leave it's current location by the end of this month. 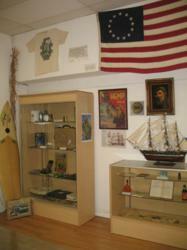 For the first time in it's history, the marijuana collection may be available for companies or individuals to sponsor individual exhibits, or the entire museum. This is the best collection... that I have seen on public display in North America. Officials from Oaksterdam University and the Oaksterdam Cannabis and Hemp Museum announced the relocation plans for the Oaksterdam Museum collection. The museum, founded in 2010, features both historic and contemporary items related to marijuana prohibition and the cannabis plant, must move to a new location by June 30. The relocation is a result of concerns raised by the City of Oakland about having the publicly accessible museum in a shared space with a downtown Oakland medical cannabis dispensary. The museum has been closed to the public since federal authorities raided founder Richard Lee's home and businesses, which were subsidizing the museum's operational costs previous to the raid. The team managing the museum collect is actively seeking companies or individuals to sponsor exhibits or the entire museum. The school staff, primarily volunteers, are focused on holding classes, adding new courses and preparing to seek private investment. Oaksterdam University does not have the resources to operate the museum as a full time attraction open to the public, but plans to offer a calendar of special exhibition days each month. A crew of a dozen volunteers, including expert consultants from San Francisco's most renowned museums, donors, alumni and current students from the school assembled this week to document and begin carefully wrapping the growing array of historic cannabis education artifacts, some extending back to the turn of the last century. The individuals working on the relocation are receiving training on safely handling collections, along with detailed lessons in the US government's role as a major industrial hemp producer and the ancient history of the cannabis plant utilized medicinally in cultures around the world. Oaksterdam University Student Services and Information Center is located at 1734 Telegraph Avenue in Oakland, open to the public Monday through Friday 10:00am - 6:00pm and Saturdays 10:00am - 5:00pm and can be reached at (510) 251-1544 or http://www.oaksterdamuniversity.com. To reach the museum staff directly email them at museum(at)oaksterdamuniversity(dot)com.